in bulk – simply by entering their barcodes into our website? WeBuyBooks offers the easiest and simplest way to sell books in bulk. Once you have entered the barcode into our site, we give you a quote for each item. Once you’ve finished entering barcodes, you head to the checkout, arrange a collection, and then watch the money hit your bank account or PayPal. Many people choose to sell books in bulk to clear up space in their homes. With most titles now available in digital format, the need to have a collection of books at home is disappearing. Books take up a lot of space, so if you have stacks of them, selling in bulk will instantly free up that extra cupboard or that handy storage shelf. We check the prices of our competitors regularly to ensure that we can offer you a higher price in comparison. 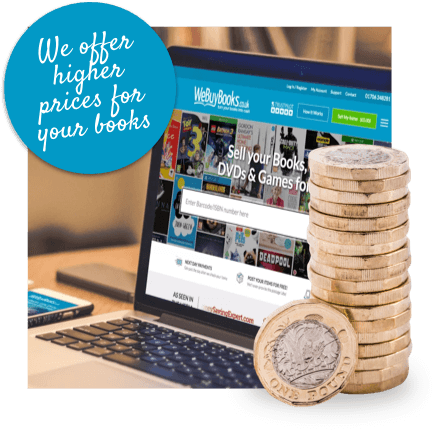 By selling in bulk with WeBuyBooks, you are likely to see a considerably higher income than using any other site – all whilst clearing your home of clutter. We give you an instant price on all accepted books and, if you sell in bulk, you will soon see that amount rise. It’s a well-known fact that books are heavy, particularly when packaged together. So carrying them to car boot sales or library sales can be an extremely physical task, and can limit the amount you are able to take. Even when selling through many of our competitors, you are likely to have to carry them to a pick-up point yourself. At WeBuyBooks, we offer a convenient pick-up service from most homes or businesses, meaning that there’s no limit to how much you can sell – and no difficult lifting. and turn your books into cash. Head over to the selling basket and type in the ISBN number on the back cover of your book. We’ll give you an offer and if you’re happy with it, you can post your stuff to us (for free) and we’ll send some cash your way. Selling books in bulk really is that simple when you use WeBuyBooks. And now you’ll get paid quicker than ever with next day payments. If you want to make things really easy, then make sure you download our mobile app too! You can sell your books in bulk on the go thanks to our handy app, which turns your smartphone camera into a scanning device. 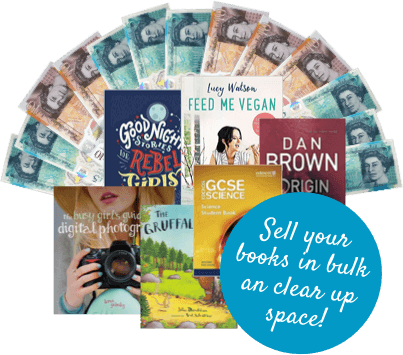 For more information on how to make money and sell books in bulk at the same time feel free to give our customer care team a call on 01706 248281. If you’ve recently used our service to sell books in bulk and you’d like to give us some feedback head over to Facebook or Twitter.